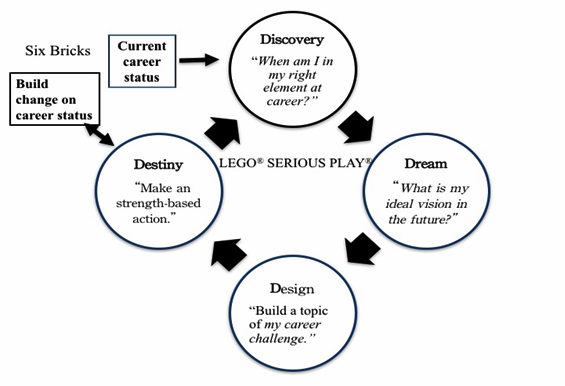 This study adopted strength-based approach career developments as the core counselling strategy to form the “4D” stages to strengths, integrated LEGO® SERIOUS PLAY® and Six Bricks to construct a strength-4D LEGO® career model for exploring its effect on career hope and the content of change resulting. In this study, 29 Taiwanese college students were recruited to participate in a six-hour workshop. Pre-test and post-test were conducted using Career Hope Scale. One-way analysis of variance was used to explore the change effects. Two additional open-ended questions were included in the post-test questionnaire, and content analysis of the responses was performed to explore the contents of change. The results indicated that the participants’ scores on career agent and career path exhibited significant immediate effects. The proposed model presented the following positive effects: flow ensues after overcoming challenges; connecting with the society for a stronger cohesion; building toward an epiphany that leads to positivity; nourishing strength for a more profound insight; facing fears and accepting the challenges; reigniting passion and establishing an anchor; and broadened thinking leading to a career shift. College students are at the exploration stage of Super’s career development theory and Erickson’s psychosocial development stage of identity and role confusion. At this point, college students could form coherent self-concepts through exploring their career paths and deepening understanding of self and professional identity (Erickson, 1968; Super, 1980). Numerous scholars in recent years have suggested that combined use of visual, operational methods and verbal sharing is conducive to achieving deeper and faster career reflection, as well as clearer career goals (Barton and Ryan, 2014; Guauntlett, 2007; Harn, 2016; Peabody and Noyes, 2017). LEGO® facilitated methods are increasingly used to develop the professional identity and career orientation of workers and students; this approach has produced affirmative outcomes in achieving clearer self-identity, deeper self-career concepts, and tangible career goals (Harn, 2016; Harn and Hsiao, 2018; Peabody, 2015; Peabody and Noyes, 2017). Two types of LEGO® facilitated methods are commonly used across the world. One is LEGO® SERIOUS PLAY® (LSP), the other is Six Bricks. LSP and Six Bricks both apply flow, positive emotions, and other mechanisms of positive psychology to assist participants to gain insight into the meaning of their life and unknown facts. 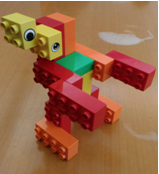 These activities involve using LEGO® bricks for storytelling and metaphors to explore the intrinsic meanings that participants are trying to convey (Bab and Boniwell, 2017; Harn, 2016; Harn and Hsiao, 2018). In this study, the strength-based approach career development was adopted for a strength-based career counselling (Schutt, 2007), using LSP as the facilitated method and Six Bricks to achieve real-time evaluation and self-feedback. The proposed model was used to explore its effect on the career hope of Taiwanese college students and the associated contents of change. LEGO® SERIOUS PLAY® (LSP) is a facilitated method for creative thinking and problem-solving, in which participants are invited to build symbolic or metaphorical models of their insights with LEGO® bricks and then present these to other participants through storytelling. Such exercise could be repeated multiple times in different iterations and yet the central LSP process always begins with an introductory phase where participants acquaint themselves with the LSP method. After the introductory phase has been completed, the LSP facilitator can then take the participants to more advanced phases, with each increasing in complexity in terms of time requirement and the problem attributes (Gauntlett, 2007). The advanced phases or core LSP applications more specifically include building shared model (The LEGO Group, 2010), building connections within or across the shared models (Bab and Boniwell, 2017), identifying emergent future scenarios and formulating responses for adapting to change (Kristiansen and Rasmussen, 2014; Peabody, 2015). The most notable core LSP applications include “Real Time Identity for you”, “Real Time Strategy for the team” and “Real Time Strategy for enterprise” (Frick et al., 2013). While the “Real Time Identity” application of LSP serves to explore self-identity at individual level, the “Real Time Strategy” applications oriented toward group dynamics and shared organisational identity. These applications help individuals to clarify career concepts and professional identity, develop career response, and define career orientation (Kristiansen and Rasmussen, 2014; Harn, 2016). Studies have examined the learning outcomes of LSP activities, such as improved academic performance (Hussain et al., 2006), increased confidence (Kristiansen and Rasmussen, 2014), and accelerated group cohesion (Peabody and Noyes, 2017). Peabody and Noyes (2017) applied LSP in reflective practice pedagogy with 29 occupational therapy graduate students and faculty members. Peabody and Noyes (2017) concluded that LSP accelerates deeper thinking and improves inclusive learning and promotes group cohesion. LSP also holds substantial potential in counselling; Peabody (2015) for instance, applied LSP in the supervision of play therapy. Consistent with the findings of Gauntlett (2007), Peabody’s (2015) research showed relevance for further research in clinical supervision and occupational therapy. When given an engaging supportive environment to learn in a playful manner, the participants of LSP often experience positive emotion and affective experience (Kristiansen and Rasmussen, 2014). LSP also allows participants to share their experiences, reflect on their feelings, and express their emotions as part of the process (The LEGO Group, 2010). Using LEGO bricks as metaphorical models, the LSP method can be used in different settings and for various purposes, ranging from brainstorming, to teambuilding, product development, and even career development. The process of expressing ideas metaphorically offers a safe zone for participants to address personal or sensitive issues without having to declare them explicitly. LSP also offers participants occasion to examine their sense of identity and understand themselves better (Gauntlett, 2007). In 2013, Hutcheson proposed: “What if 6 bricks were all we needed to ensure that perceptual skills were developed?” Based on the idea of Hutcheson (2013), the LEGO Foundation developed and released Six Bricks Booklet in 2016, introducing how LEGO can be used to engage and challenge children in playful ways and at the same time develop problem-solving, teambuilding, and language skills. The idea of Six Bricks has been extended beyond pre-school education and adopted by practitioners to teach programming (Hood and Hood, 2005) and manage stress (Harn and Hsiao, 2018). LSP has also been used in counselling and psychotherapy. 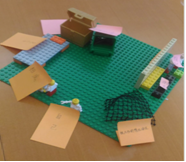 For example, Harn (2017) constructed strength-based LSP facilitation workshop to explore the empowering effect of LEGO workshop on survivors of domestic violence. Harn’s results revealed that the workshop ingrained inner strengths, developed strengths in a relationship, and reconstructed life experience. Having originated in positive psychology, strengths-based counselling focuses on the inherent strengths of individuals and build on their best qualities (Peterson and Seligman, 2004; Schutt, 2007; Smith, 2006). Such strength-based approach helps to set up a positive mindset and focus less on shortcomings, failures or weakness (Wong, 2006). Hence, the participants of strength-based counselling would be able to cultivate and develop strengths and see themselves in a more positive way. Based on the work of Cooperrider and Srivastva (1987), Schutt (2007) adopted a strength-based approach to career development by using the appreciative inquiry 4D model of discovery, dream, design, and delivery/destiny. The goal of the Strength-Based Approach to career development is to create an action plan that honours person’s strengths and articulates her or his hopes for the future. The keys to this process are as follow: (a) finding the seeds of excellence on which to develop, (b) creating images of excellent in hopes that the creating images of excellence in hopes that individual moves toward those, and (c) developing a plan engages all the important people and forces in a person’s life (Schutt, 2007). The purpose of this process is to create a positive self-image and allow the individual to envision even greater possibilities based on strengths. A brief outline of the process (a) Introduction to the process, (b) Discovery phase, including the appreciative interview, the imagination of the future etc. (c) Dream phase, including locating my personal themes, constructing my ideal-life scenario etc. (d) Design phase, innovative ways to create my future, action plan etc. (d) Density phase, including finding possible bumps in the road, and sustaining my positive possibilities (e) Valuing the process of building on strengths (Schutt, 2007). Fitzpatrick and Stalikas (2008) indicated that positive emotions and function development are the mechanism of change in strength counselling. Positive emotions can broaden the array of thoughts and immediate actions that come to mind and in turn build personal resources for developing coping strategies to survive the impacts in life. Positive motions can offset the negative effects of negative emotions, a phenomenon called undo hypothesis (Fredrickson and Levenson, 1998). Strength-based counsellors believe that positive affect promotes interactive effects among cognition, emotion, and action, thereby generating a change. The discovery of strength is driven by hope perception (Ward and Reuter, 2011). When facing life difficulties and challenges, individuals often develop a sense of hopelessness. By contrast, a hope for change represents a “readiness” for change (Ward and Reuter, 2011: 58). Goal-setting allows individuals to restore hope and identify their “preferred ways of being” (Ward and Reuter, 2011: 90); questions such as “what I want” and “what I can do” motivate one to move forward. Verbruggen and Sels (2010) indicated that having career goals ensures enhanced feelings of happiness and sense of accomplishment. In short, positive emotions and hope are the cornerstones in strength-based counselling. Empirical research showed that strength discovery and development are related to life satisfaction (Rust et al., 2009; Wang and Tien, 2011), happiness (Wang, 2005; Wang and Tien, 2011), and personal growth initiative (Wang and Tien, 2011). In a study conducted by Rust et al. (2009), 131 university students were randomly assigned into three groups: a control group with no treatment and two treatment groups. While participants in one treatment group work on two strengths, the other treatment group worked on a weakness and strength for 12 weeks. The results showed statistically significant difference in life satisfaction scores between the control group and treatment groups, but there was no significant difference between the two treatment groups. As such, Rust et al. (2009) suggest that concurrently working on one’s weaknesses may provide equivalent benefits but this may not work for all people. Wang and Tien (2011) found that strength-centred career counselling has impacts on the personal growth initiative and feelings of happiness among dual career women. Similarly, Wang (2015) applied strength-centred career counselling to junior high school students and found that this type of counselling therapy helps to generate feelings of happiness among the teenagers. In summary, strength career counselling demonstrates different levels of positive effects. Unlike the conventional strength career counselling model, LEGO® facilitated method guides participants through “hand-mind connection” (The LEGO Group, 2010: 8) to discover self-identity, cultivate personal interests, deepen reflection, identify and build character strengths. This study incorporates Six Bricks as a career evaluation instrument, which broadens visual and interpersonal connections. Therefore, the objective of this study was to explore the effect of the strength-4D LEGO® career model on the career development of Taiwanese college students. This study was conducted in collaboration with the career guidance centres of two universities in Taiwan. Both universities assisted with the recruitment, enrolling 19 and 10 college students respectively. The participants consisted of fourteen men and fifteen women, aged between 18 and 22. Single-subject experimental design was used to verify the effects of the strength-4D LEGO® career model. The participants (n=29) were allocated into two groups according to their schools; one group comprised 19 students and the other 10 students, all of whom received a 6-hour the strength-4D LEGO® career model per day. This study employed quantitative research design and qualitative analysis to investigate the effects and content of change, briefly described as follows. Single-subject experimental design was adopted. The facilitator administered a 6-hour the strength-4D LEGO® career model. Pre-test and post-test were performed using a Career Hope Scale 3 day before the session and after the session. The tests were analyzed using one-way analysis of variance (ANOVA). Two additional open-ended questions were included in the post-test questionnaire: (a) Which part of this session did make the deepest impression on you? (b) What did you learn from this session? Content analysis was performed to analyze the contents of change. The 6-hour strength-4D LEGO® career model was facilitated twice by one qualified facilitator who was the researcher of this study. Both researchers, one is a Ph.D. degree and the other is Master degree in counselling psychology, have received LSP and Six Bricks certification. Both researchers took charge of data analyst for subsequent data analysis. Career hope scale. This study adapted the construct of the Trait Hope Scale (Snyder et al., 1991). The scale contained nine items, with five of them on Career Agent and four on Career Pathway. The four Career Pathways items reflect the cognitive abilities to pursue personal goals, for example: “I can think of many ways to get out of a jam”, “There are lots of ways around a problem”, “I can think of many ways to get the things in life that are most important to me”, and “Even when others get discouraged, I know I can find a way to solve the problem”. The Career Agent items, on the other hand, cover the sense of successful determination, which include “I've been pretty successful in life”, “My past experiences have prepared me well for my future”, “I energetically pursue my goals”, and “I meet the goals that I set for myself”. These nine items are rated on a 6-point scale, ranging from strongly disagree (1) to strongly agree (6). Regarding reliability, Career Agent and Career Pathway exhibited internal consistency Cronbach’s α of .91 and .88, respectively. The Cronbach’s α of the overall scale was .93. Factor analysis showed that the factor loading of the items in the two dimensions was greater than .84. This study adapted strength-based approach career development (Schutt, 2007) as the core counselling strategy to form the “4D” stages of discovery, dream, design, and destiny relating to strengths (Figure 1). This study also adopted the Strength and Empowerment Card (Harn, et al., 2016) and Occupation Card (Li and Huang, 2011) as the cue card during the process of LEGO® facilitation. Based on the Classification of Strengths developed by Seligman and Peterson (2004), Strength and Empowerment (SE) cards centre on six virtues and 24 advantages. In total, there are 72 narrative sentences of strengths of the SE cards. Occupation Card covers a variety of occupational names for participating members to choose future careers. The whole process is divided into six stages, which are described in the following sections. Evaluation: Building DUPLO® career figure and career scale to present current career status. The facilitator first introduced the four identity statuses proposed by Marcia (1966): identity diffusion, identity foreclosure, identity moratorium, and identity achievement. For this study, the researcher revised the “Good Friends” and “Secret Bag” activities in Six Bricks (LEGO Foundation, 2016) and then asked the participants to build a DUPLO® career figure representing their career identity with Six Bricks, which was used as their self-assessment. Figure 2 illustrates a participating student’s career figure of eyes looking in two different directions, which represent the undecided career position in face of multiple career choices. Next, the facilitator invited participants to build a DUPLO® career scale with Six Bricks; the two ends of the scale represent the participants’ career beginning and career goals, respectively. Participants then positioned the DUPLO® career figure on the DUPLO® career scale according to their status quo (Figure 3). 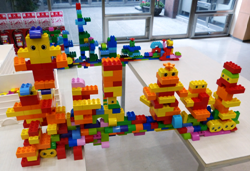 In the process, their DUPLO® career scale had collapsed multiple times; however, the participants worked together again and again to rebuild the scale. This experience facilitated boosting team cohesion. Compared with using LEGO® bricks, using DUPLO® bricks to build the figure and scale provides a broadened tangible and visual image of one’s career path. When the groups built the DUPLO® scale together, they were able to establish emotional cohesion and social ties with one another, which facilitate an enhanced team engagement. Discovery: Exploring professional identity and career strengths. At this stage, LSP was adopted for building the 4D stages. First, the facilitator provided a skill building of the LSP, and then invited the participants to build models of their answers to the following questions: (a) In your opinion, what are the values of the expertise in which you are studying? (core identity); (b) In others’ opinion, what are the values of the expertise in which you are studying? (others’ identity); and (c) In your field of expertise, what should you do to make yourself a better person? (aspirational identity). Subsequently, the participants arranged the three models of identity (Figure 4) to explore model associations and the core dimensions with which they identify. Through this process, participants were assisted to begin exploring the context of their professional career development. The facilitators began guiding the participants to explore the strengths in their career. First, the facilitators invited participants to build a model in response to the question, “When am I in my right element at study?” and then use the SE Card to indicate their career strength. Second, the participants were asked to swap places and indicate the career strength of their partners, compile the opinions of their own and others to form the positive core of career stories (Figure 5). Swapping places was aimed at helping participants to identify any undiscovered strengths and create positive effects such as team empowerment. Dream: Building career aspirations. Following the aforementioned strengths empowerment, the facilitator guided the participants to seek potentially positive aspirations. Therefore, the facilitator invited the participants to build a model of the answer to the question, “What is my ideal job ten years later?” The participants were given the option to choose their answer from the Occupational Card or think of one by themselves. The goal of this activity was to build a feasible career goal by leveraging existing strengths. This process reflects a type of strength-based magical thinking in which college students are assisted to think about the type of workplace they will be in the future if another peak experience happens again. Design: Exploring career challenges. In the Design stage, the group has to “wake up” from their “dream,” return to the reality where career challenges await them and think about what they should focus on. At this stage, participants were guided to build a model that represents the greatest challenges in attaining their career aspiration. Next, the shared model technique of LSP was applied to form a shared model of career challenges (Figure 6) and establish the potential challenges. This process facilitates creating group universality and connection. Destiny: Developing strength-based actions. The participants developed a plan of action according to their core strengths and career challenges, and subsequently shared their plans. Listening to the solutions of others can inspire more diversified strategies. Empowerment: Readjusting DUPLO® career figure and repositioning career position on the scale. Finally, the participants were guided to re-examine the DUPLO® career figure and career scale, readjust them according to their current career status, and use them to describe their changes. Taking the DUPLO® career figure shown in Figure 3 as example, the participant used two unfocused eyes to represent uncertainties in his career status. After a series of career building through LSP, the participant readjusted the “eyes” to face forward, suggesting a change from career uncertainties to a definitive career choice. Subsequently, the participants repositioned their career figure on the scale. A third of the participants moved their career figure forward to the goal end, which indicates that they have seen more. Only a few participants chose to move their career figure backward to the starting point; these participants expressed that they were able to see the reality more clearly and that they need to work harder and make more changes. This activity enabled the participants to reveal aspects of their identity that could not normally be observed (Gauntlett, 2007). Table 1 shows that the strength-4D LEGO® career model generated immediate significant effect on the career agent, career path, and career hope of college students. Answers to the open-ended questions by the 29 participants were analyzed. The obtained data were coded and classified according to the qualitative research verification dimensions of positive psychological effects and career hope-building. Flow ensues after overcoming challenges. Most of the participants had a deep impression of building the DUPLO® career scale with their partners. They expressed that this task was difficult and required communication and teamwork. In addition, a member felt a noticeable change in the building process of LSP: from finding it difficult to knowing exactly what to do and be in total control over it. Connecting with the others for a stronger cohesion. The participants’ DUPLO® career scale had collapsed multiple times. The moment they had completed the DUPLO® career scale, the participants had undergone a memorable team experience, which evoked a deep moving sensation and a feeling of having accomplished something great. These reactions quickly developed into social and emotional connections. In building a shared model of career challenges in the LSP process, the universality of challenge issues and the different responses to them have made participants feel that they are not alone and that they have access to broader supply of resources to cope with the challenges in their career. Building toward an epiphany that leads to positivity. While building their LEGO® models, the participants thoroughly enjoyed themselves; they were able to let their imaginations run wild and demonstrate their creativity. These experiences evoked positive emotions, stimulating diverse and flexible ways of thinking that generated increased flow of response strategies and emotional regulation. Tangible building experience granted some participants the chance to see themselves from different point of view, engage in deeper self-reflection, finding meaning in themselves, and perceive pleasant experiences more deeply. Nourishing strength for a more profound insight. Through building tangible and visual presentations of their strengths, the participants were able to feel more positively about themselves and have a clearer picture of themselves. Therefore, the participants perceived their career capabilities in the strength building process through the eyes of themselves and others. Self-discovery of career capabilities provides insight into not only the resources available around them but also a clearer picture of the reality around them, forming an effective path of career adjustment. Facing fears and accepting the challenges. LEGO® building boosted positivity in an environment, helping the participants to get rid of negative emotions and face the future with open arms. In the challenge model building process, several participants perceived their own fear and with their hands converted into a psychological experience of overcoming this fear. In the career challenge building process, the participants accepted their self-constraints and turned them into a driving force to move on. Reigniting passion and establishing an anchor. When the participants positively examined their self-constraints, the effect thereof is a constructive motivation in their career development. Therefore, a number of the participants indicated that they have the ability and resources to move forward with certainty and to see their career goals more clearly. Broadened thinking leading to a career shift. Clear career goals and perceived career resources are key factors promoting career shift in the participants. At the end of the workshop, the participants were able to define a career position, respond to their career calling, and in turn persevere in their plan of actions. A third of the participants exhibited a forward or backward career shift on the LEGO® DUPLO scale, which reflects different ways of thinking about their career development. The participants’ score on the Career Hope Scale significantly improved after attending the workshop, indicating that this career model positively influences the career hope of college students. This result supports evidence from previous research (Rust et al., 2009; Wang and Tien, 2011; Ward and Reuter, 2011) which concluded that positive emotion and hope perception are key to strength-based counselling. Consistent with the positive emotion resilience effect (Fredrickson, 2009), the process of strength exploration empower the participants to face their fears and overcome challenges without ruminating over their negative emotions. The “hand-mind connection” of LSP allows the participants to translate abstract ideas into something concrete, which not only facilitates career goal setting but also provides a clear career path. The results of this study also showed that the participants were able to think with their hands when building a model of their inner fear. This engaging hands-on environment led to a positive experience such as “what impressed me the most was that I could build out my inner fear.” This result reflected the goals of LSP and Six Bricks—building knowledge and emotional regulation (Hutcheson, 2013; Kristiansen and Rasmussen, 2014; Rillo, 2015). In a recent research on survivor of domestic violence, Harn (2017) noted that the participants established connection with other participants through strength based LSP workshop, and this connection encouraged them to break through their mental barriers. 5.2. To enrich positive psychological capital. Previous studies on strength-based career counselling asserted that identifying and cultivating strengths promotes career development and leads to the accumulation of positive psychological capitals (Rust et al., 2009; Wang, 2015; Wang and Tien, 2011). Similarly, a Strength-4D LEGO® career model deepens social connection and enhances positive emotions. However, LEGO® facilitation provides participants an opportunity to make interpersonal ties and create deep emotional feelings. For example, having to rebuild the LEGO® scale from scratch after numerous attempts eventually led to a sense of team achievement, which brings about moving sensations in each individual participant, sense of accomplishment, and deeper self-worth. 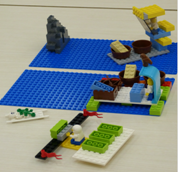 The participants reported improved self-creativity, self-imagination, and attention during the LEGO® building activity, particularly in an enjoyable, pleasant environment where team involvement is elevated. Based on the aforementioned discussions, LEGO® facilitation not only yields the positive effects of conventional strength career counselling, but it also gives rise to more positive psychological capitals and tangible experiences of social connection, both of which are beneficial for career adaptation and development of psychological resilience. Conventional strength career counselling requires at least 6 hours for individual counselling and at least 12 hours for group counselling (Rust et al., 2009; Wang, 2015). In this study, the proposed model involves a 6-hour group workshop that accommodates 10–19 people. As suggested in the aforementioned findings, the counselling model provides affirmative outcomes, including enhanced sense of career hope and diversified positive psychological capitals. This model is also efficient and less time-consuming, which accords with the results of Peabody and Noyes (2017). Furthermore, tangible, colourful, and visual-stimulating of LEGO® bricks building provides a positive experience that is hard to forget, which is evident in the participant’s comment “what I remembered the most was seeing the DUPLO® career scale, a passage to our future, carrying everyone’s hope.” LEGO can be used to make connections; for example, the participants could build universal models of their ideas and establish a universal visual image by building LEGO® bricks. A visual image is easily extracted and ingrained. Psychological capitals created alone or in a team can be deep-rooted in the minds of participants through memories of actual 3D images, and the positive energies accumulated in the process can be extended to developing their career. This study adopted LEGO® facilitated method in place of conversational strength career counselling. The Strength-4D LEGO® career model adopted in this study can enhance group involvement, create flow experience, establish stronger interpersonal ties, diversify positive psychological capitals, and also quickly help college students to explore their career options, positions, and action plans. This model has great potential as a tool in career counselling. In practical applications, education units can use LSP and Six Bricks to organise career development programs, providing college students with an opportunity for multidisciplinary career exploration and orientation. This is especially useful for college students with weaker career prospects. In the future, practitioners could consider increasing the number of hours for LSP sessions, because as a method LSP tends to be cognitively demanding and may lead to fatigue of participants if it is implemented within a limited time frame. In the long-term programs, practitioners could consider incorporating Six Bricks and DUPLO® Play Box in order to increasing variety of learning patterns in developing longer-term career aspirations and/or plans. Future studies could incorporate additional measures of dimension and prolong follow-up period to increase the reliability and validity of the study results. Furthermore, the mechanism of change arising from LSP and Six Bricks is also a crucial topic warranting investigation; the process of change can be investigated through qualitative analysis of observations, historical records, and reflective journals. LEGO, SERIOUS PLAY, the Minifigure and the Brick and Knob configurations are trademarks of the LEGO Group, which does not sponsor, authorize or endorse this academic work by Payling Harn, Hsuan Chuang University, and Chaochi Hsiao, Asia Six Bricks Consulting Lab, Taiwan. Bab, M. and Boniwell, I. (2017), Exploring positive psychology with LEGO® SERIOUS PLAY®, Aarhus: Gnist. Cooperrider, D.L. and Srivastva, S. (1987), “Appreciative inquiry in organizational life”, In: Woodman, R. W. and Pasmore, W.A. (Eds. 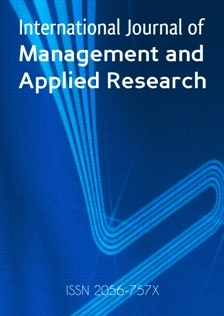 ), Research In Organizational Change And Development, Vol. 1. Greenwich, CT: JAI Press, pp. 129–69. Erickson, E. H. (1968), Identity: Youth and crisis, New York: Norton. Fredrickson, B. L. (2009), Positivity, New York: Three rivers press. Frick, E., Tardini, S., and Cantoni, L. (2013), White paper on LEGO®SERIOUS PLAY® : A state of the art of its application in Europe [Online] Available from: http://s-play.eu/attachments/article/70/splay_White_Paper_V2_0_1.pdf [Accessed on 23 July 2018]. Gauntlett, D. (2007), Creative explorations: New approaches to identities and audiences, New York, NY: Routledge. Harn, P. L. (2016), “The Model and Effect of Strength Centered Career Workshop with LEGO® SERIOUS PLAY®”, in: Global community conference for certified facilitators of LEGO® SERIOUS PLAY®, Billund, Denmark, 3-4 October, 2016. [Online] Available from:http://seriousplay.training/wp-content/uploads/2016/10/LSP_conferenece_2016_0930.pdf [Accessed on 23 November 2018]. Harn, P.L., Syu, T.R., Lin W.L., Yang L.H, Han S.J., Ni J.N., and Sun, Y.D. 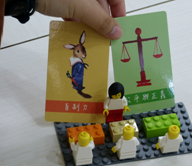 (2016), Strength and Empowerment Card, Taipei: Psychological Publishing Co., Ltd.
Hussain, S.; Lindh, J. and Shukur, G. (2006), “The effect of LEGO Training on Pupils' School Performance in Mathematics, Problem Solving Ability and Attitude: Swedish Data”, Journal of Educational Technology & Society, Vol. 9, No. 3, pp. 182-194. Hutcheson, B. (2013), Back to Basics with 6 Bricks: develop working memory, perceptual, speaking and listening skills, Ashoka Changemakers. [Online] Available from: https://www.changemakers.com/play2learn/entries/back-basics-6-bricks [Accessed on 6 November 2017]. Kristiansen, P. and Rasmussen, R. (2014), Building a better business using the SERIOUS PLAY method, New York: John Wiley and Sons. Li, W.J., and Huang, S.J. (2011), Occupation Card, Taichung: Cards House. Nolen-Hoeksema, S., Fredrickson, B., Loftus, G., and Wagenaar, W. (2010), Atkinson and Hilgard’s introduction to psychology, Singapore: Cengage Learning. Peterson, C. and Seligman, M. E. P. (2004), Character strengths and virtues: A handbook and Classification, New York: Oxford University Press. Rillo, M (2015), Six Bricks for Countless Exercises, SeriousPlayPro.com [Online] Available from: http://seriousplaypro.com/2015/05/12/six-bricks-for-countless-exercises [Accessed on 6 November 2017]. Schutt, D. A. (2007), A strength-based approach to career development using appreciative inquiry, Broken Arrow, OK: National Career Development Association. LEGO® Foundation (2016), Six Bricks Booklet, Billund, Denmark: The LEGO Foundation. [Online] Available from: https://www.legofoundation.com/en/learn-how/knowledge-base/six-bricks/ [Accessed on 6 November 2018]. The LEGO Group (2010), Open-source: Introduction to LEGO® SERIOUS PLAY®, [Online] Available from: http://seriousplaypro.com/about/open-source/ [Accessed on 3 November 2018]. Wong, J. (2006), “Strengths-centred therapy: a social constructionist, virtue-based psychotherapy”, Psychotherapy: Theory, Research, Practice and Training, Vol. 43, No. 2, pp. 133-146.